I don’t disagree with your interpretation of “a glimmer of truth”, but begging your pardon for my “insensitivity”, I do find it particularly offensive that such a “cause” be turned into just another commodity. It’s also particularly characteristic of our age of indifference that such things are allowed to pass with little debate or comment – the questioning of commodification being the first of that triumverate of taboos of the age, the second and third of which are advertising and commercialized television. 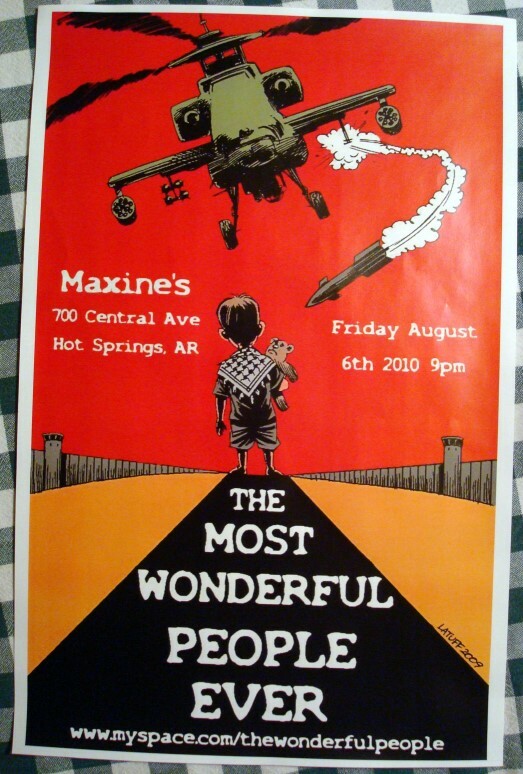 There are no indications on the MySpace pages of either “Maxine’s” or the particular band in question that they are not using the Gaza prison theme as yet another branding of a lifestyle now deemed palatable enough with the target generation not to elicit a commercially negative backlash by those meant to be provoked. The poster itself is quite representative of what the ‘Palestinian Cause’ has become to most of the generation dedicated to “creating, thinking and doing things that make them feel great and happy”. The weaponry, so long commodified that a significant portion of US males will know the brand names of the helicopter and its armaments by heart, even without having had the leave to serve the nation’s interests as canon fodder. Those walls and watch towers were commodified, first by the victory industry that served (and continues to serve) our generation’s apparently insatiable appetite for the documentation of the suffering of others, fictional or otherwise. One needs only to be reminded of the presidencies of Eisenhower, de Gaulle and Ronald Reagan to understand the industry’s success. In it’s wake, the Haulocast Industry has also done rather well off the same iconography. The most perverse commodification of all, and I suppose so far most widespread in Europe, is the white-and-black kafiyeh. To Mr or Ms Latuff’s credit (is that an americanization of “Lateef”?) the kafiyeh appears mostly correct, mimicking that over-used to the ridiculous by that master of corruption Abou Ammar. In its most recent incarnations produced in Bangladesh in green, yellow, red, orange and very blue – there is, inexplicably, a version with the Star of David in the cross pattern! Maybe counter propaganda through commodification is the only way of getting the message through in our commercialized age, but it does take politics (the public affairs of a country) away from us, putting it into the hands of the men (and a few females) at the service of those intent on even shorter returns on investment than four (or even the hopelessly longer term of eight) years. [Jacques], your Polish proprietress was gracious indeed, but then the people of Central Europe have a traditional propensity in that direction. Sheesh, Børre, I didn’t expect that! Were you channeling Thom’s inner (outer/all-over) curmudgeon? I thought there was sublime anti-anti-Semite irony in the juxtaposition of “The Most Wonderful People Ever” over the image of a young Palestinian (with a teddy bear, no less — hardly the swarthy stereotype) about to be violently aborted by “God’s chosen people” flying a made-in-the-USA death chariot. …for what it’s worth, the “Wonderful People” had the decency to leave Mr. Latuff’s signature intact on their poster. Finally, thank you Børre for your kind words about a plurality of Poles having a propensity for amity; that has been my observation as well, though my sampling is hardly statistically significant. Lest any reader think I am likewise surprised that this woman was gracious, let me affirm that it has also been my observation that most women are far more gracious than we men deserve (and that, friends, is borne of a lifetime of diligent study of a statistically significant sample). PS — we had the pleasure of stopping by Maxine’s last Thursday to hear Sad Daddy (http://www.myspace.com/saddaddyband) for an hour or so. If you like what our local blues expert terms “Acid Bluegrass” then you should check them out — they’ll be at several locations around Austin later this month. PPS — any Beirut readers out there? A month ago John Nemeth (rising Bluesman from San Francisco — http://www.johnnemethblues.com/) passed through our wee blip on the map. He just wrapped up four/five days in “Bar Louie” in Beirut — did anyone catch the act?